The last time I was cruising Target, there was some really fun "gardening" themed items that caught my eye in the Dollar Spot and I just had to stop and check them out! Within a matter of seconds, I had everything I needed to put together a sweet little gardening gift basket (galvanized bucket, set of three plant markers, wildflower seed mix, pink gardening gloves, & three flower seed packets)...all for under $5! Sadly, I don't garden (not even a hint of a green thumb)...but I SO envy those that do :-). I may not grow flowers, but I love to stamp them - and I knew I could dress these garden gift items up in no time with the Fresh Flowers set! 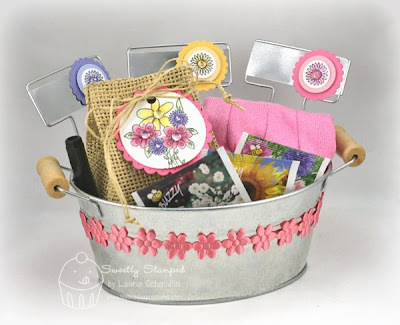 I customized the contents of the gift basket by adding some stamped flowers to the Plant markers, a floral bouquet tag to the wildflower mix, & some matching flower ribbon (from April's Key Ingredient Subscription Kit) around the cute little galvanized bucket. Laurie - what a darling gift! Your stamped flowers are adorable with the dew drop centers! Who ever the recipient is, they're going to just love your loving gesture. Very cute, Laurie! Love the colors. So fresh and springy. A great gift! So adorable, Laurie! I LOVE it! This is adorable! I've been away from the Target Dollar Spot entirely too long! What a darling gardening basket. I really must take a better look at the Target Dollar spot next time. Thanks for sharing this information on fresh flowers gift basket. Couple of weeks ago, I had to Send Flowers for my cousin’s birthday through an online florist. They made an excellent flower basket and she really liked it a lot.